Aggregate is a component of a composite material used to resist compressive stress and provide bulk to the composite material. 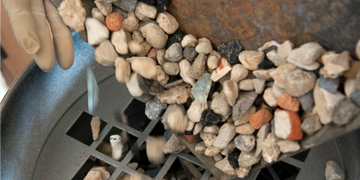 For efficient filling, aggregate should be much smaller than the finished item, but have a wide variety of sizes. It is vastly used in most combination of construction material such as concrete and asphalt technology to which aggregates may either be specified or designed to suit a particular engineering requirement while not suiting another. The properties of aggregates can vary and hence affect the final construction material. impact value, organic impurities, compacted densities, specific gravity, soundness and abrasion resistance.